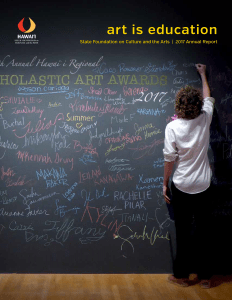 The fiscal year 2017 (July 1, 2016 – June 30, 2017) Annual Report for the State Foundation on Culture and the Arts has been published. The PDF can be downloaded or read online: SFCA Annual Report FY17. This annual report reflects a new way of looking at the State Foundation on Culture and the Arts and our accomplishments. For this report, our core foundation pillars are presented not by program, but collectively, giving readers a comprehensive picture of our work. We hope you enjoy the fresh perspective and find the information more accessible than ever. FY 2017 (July 1, 2016 – June 30, 2017) was a year of transition for the SFCA, its staff, and our community. We focused on building a stronger agency by maximizing use of existing revenue streams, expanding programs to the neighbor islands, and reaffirming relationships within the agency as well as with other state/county agencies and the Legislature. Additional information about FY 2017 can be found in the News section of our website.